She was never — not ever not even once — The Legal Genealogist’s Aunt Anna. And certainly not Aunt Annie. She was always — forever and ever amen — Tante Anna. And one of the reigning matriarchs of my German immigrant family that settled in Chicago. 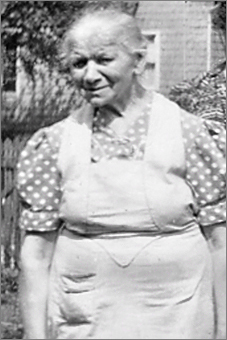 Born 149 years ago tomorrow, in the village of Bad Köstritz in what is today Germany and was then the tiny principality of Reuss jungere Linie, Anna Emilie (Graumüller) Nitschke Zons is certainly someone I wish I’d known — and about whom I wish I knew more. In between those two dates and those two events was a remarkable life, in two countries on two continents, including at least two marriages. But — because my German-immigrant father was so secretive about his family — because I never met any of his relatives and never even knew about most of them until long after his death — there is so much we don’t know. We don’t know, for example, what happened to that first husband. He wasn’t with her when she first came to America in 1904 with her brother Emil — and she didn’t use his name. The records make it clear that it was pretty much a hardscrabble life for Anna in America. Lots of menial jobs. Lots of rented quarters. But something changed in 1926, when she was nearing the end of her sixth decade. “Loving mother of Mary Ross”??? There’s no Mary in any of Anna’s earlier records. There’s no Mary in Theodore’s census records before he married Anna. Who the heck is Mary?? And what might she be able to tell me about Anna??? I wonder if Mary Ross was her husband’s child? I have often found this terminology (mother, child, etc.) even when there was no biological relationship. But good luck! She could very well tell you more about her. His child or even his grandchild, most likely. I don’t think it’ll turn out to be a child of hers at all but exactly whose child… at this point, anything is possible! Seems clear Mary Ross was alive at your Tante’s death… The person(s) who put the obit together knew of her. Hmmm. Mystery. I’m certain you’ll be a terrier about finding the details! I wouldn’t mind a hint or two, Celia! My Italian ggrandfather is shown on the 1910 Ellis Island ship’s manifest with my grandmother’s older siblings, most of which I met at one time or another. “Maria” is listed as a 13 yr old daughter. But there *was* no Maria that was a daughter. I tried to find her on the 1915 NY census with no luck. She’s not with the rest of the family, so either married or went back to Italy. Nobody in the family knows who she was. Wow, this is exciting! I had to read “Waitaminute” twice. At first, I thought it was something in German. Try church records here in the states. But the ones you want may be in German – many churches founded among and by German immigrants used German down to WW I or WW II. There were also German language newspapers in the states down to those eras. Thanks. She appears to have been the last husband’s child. Waiting for a copy of a death certificate now. Tante Anna sounds like the perfect case study for a genealogist to sink her/his teeth into. Just the right amount of mystery to pique your curiosity. Made even more intriguing by your father’s secretive approach to family history. Good luck answering these questions.